Parke Estate is one of our old haunts from the pre-digital days. We used to walk along the old granite tramway and hope that one day we would be able to afford to record and identify every species we saw. The first part of the dream has come true (when things stay still long enough and the breeze is minimal), whilst the second part is coming on nicely. Between observational mistakes and mysteries, the species count is rising. At this time of year the ground is as good a place to look as any. 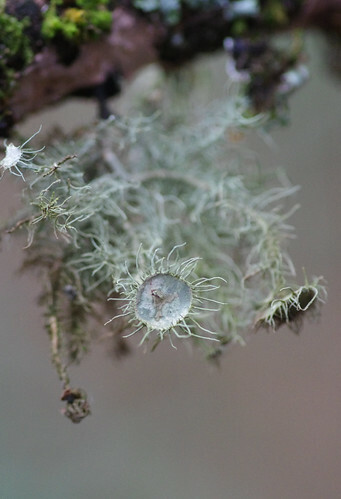 Twigs are frequently decorated with mosses and lichens. The nobbly projections were evident all the way round this twig. 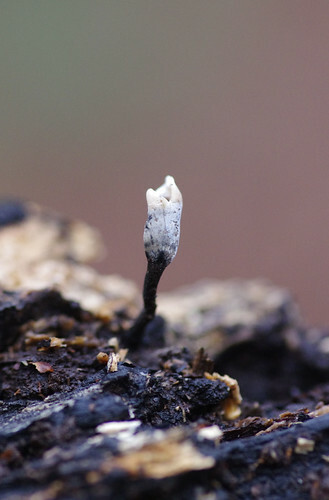 This is how a Common Earthball looks after the spores have been released. It came out a bit brighter than we saw it and Sherry took shots from a range of angles to attain the closest match. 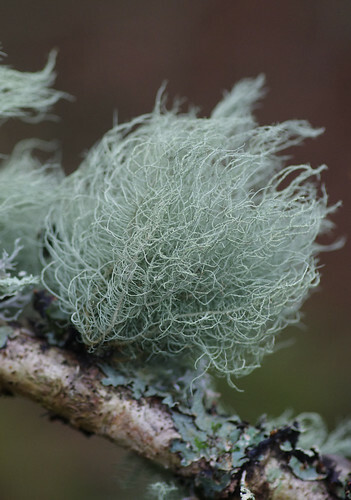 At first I thought this was the remarkably similar Usnea flammea. 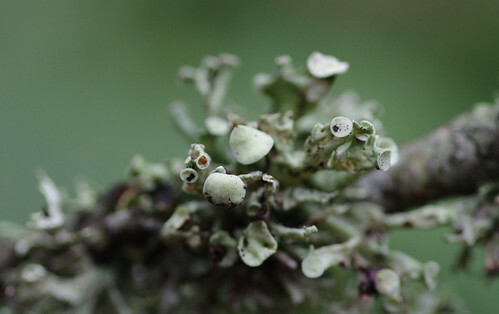 But magnifying the stems I found three examples of what had to be the minute lichenicolous fungi Biatropsis usearum. 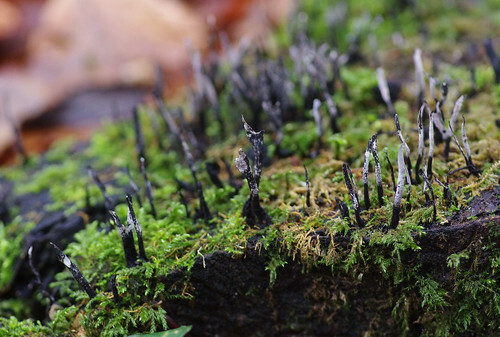 Again, there is a similar species in Bank Haircap Moss. Common Haircap plants are generally taller. 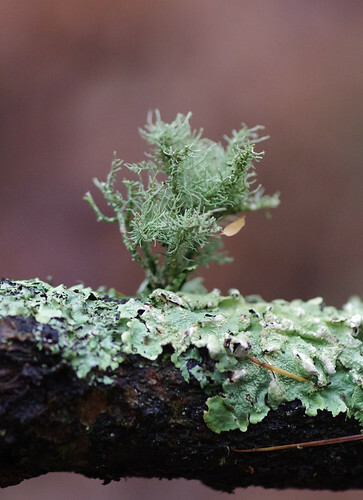 Since these photos were taken I have purchased two more field guides (one for lichens, the other for mosses and liverworts). So soon I should have more of an idea of what to look for in the field. The two shots above show the same specimen under different light. Because of the considerable colour variation, different methods are advised. I thought the one above might be of the Round-backed variety but in the top picture it appears to be arching its back naturally. 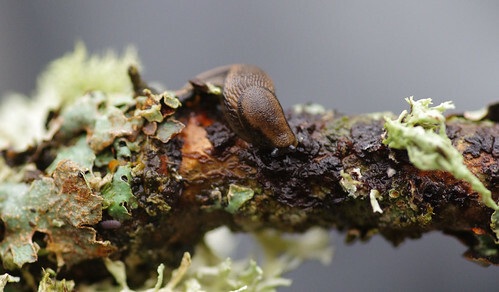 Picking a slug up and examining it underneath may determine the species but where this is not decisive, the colours of the mucus can be helpful. But I have to admit I did not relish the thought of a lot of sticky mucus on my finger! 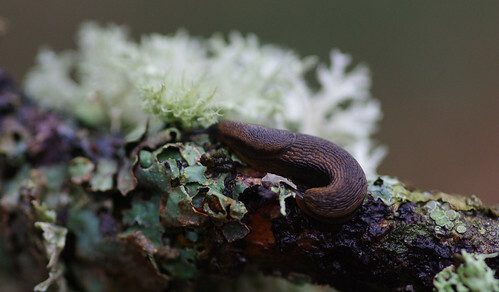 Many of the lichen shots revealed camouflaged slugs we would not have otherwise noticed. Examining one thing often leads to others being revealed. 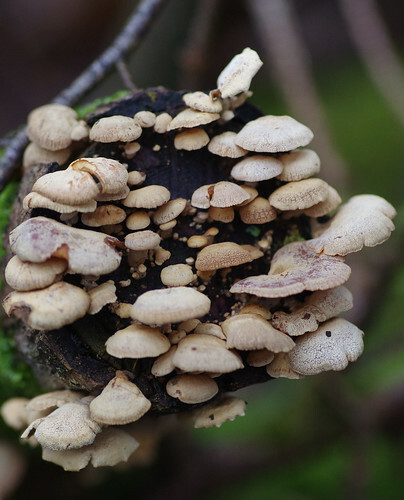 These can grow in large groups on rotting wood but this one had no immediate neighbours. 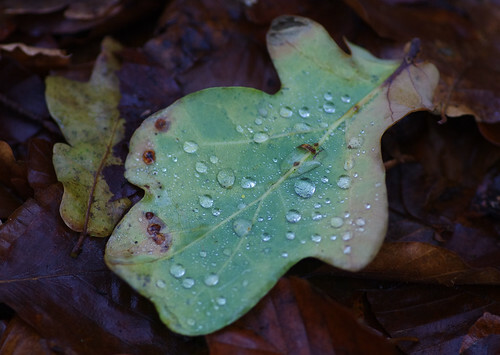 The colours of this leaf were really unusual and the arrangement of the raindrops made the capture even better. Another mystery to ponder: which species could this be? I have found no exact match but consider Bleeding Broadleaf Crust to be the most likely suspect. Other candidates include Wrinkled Crust and Rosy Crust. At the right angle this could almost have been made to look like a devastating forest fire. 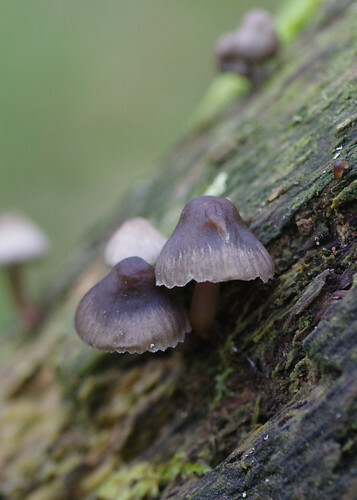 There were several frustrating attempts to get as many of the fungi in focus as possible. 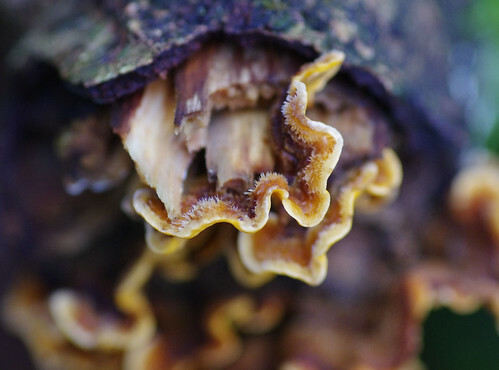 There are tiny frilly hairs around the inside edges of this species. And because it projected out at different angles, the camera struggled to get the right focus distance. This is from the same family. It is attached to wood by part of the length of the base and not the whole width. 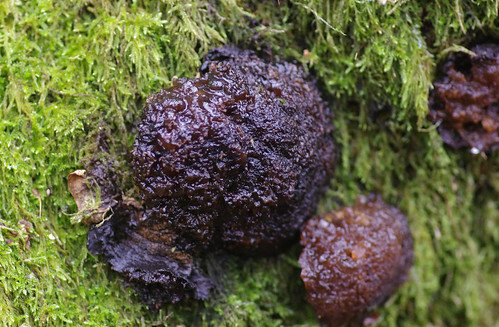 Black Bulgar or Witches Butter? Earlier this year, at Lydford Gorge, I asked the same question and hoped we would be luckier when seeing something similar again. But I forgot to take a spore print. Maybe it will be a case of third time lucky and I will be able to make a positive identification of both in the near future. 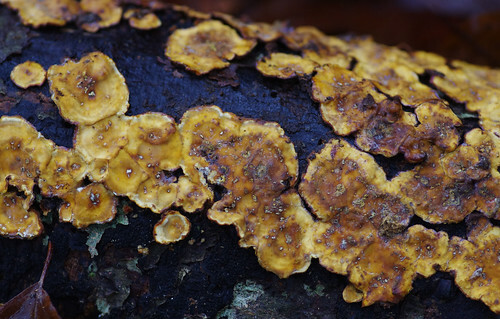 On Witches Butter, small warts can be present on the surface but they are more easily detected when dry. 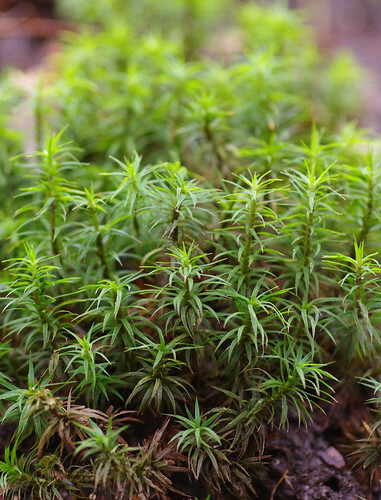 This species is more delicate than the other Usneas and is commonly described as being like brushed hair. John and Lizzie Cowling (our companions for the day) are old hands at finding flowers and fungi. It was Lizzie who found these on the branches. In a dip off the main path, this spectacular specimen was hiding. I thought it was a bit 'science fiction' at first but now think of these as the lucky amulets of a lost civilisation. The circular sori on the underside were ripe and rampant. 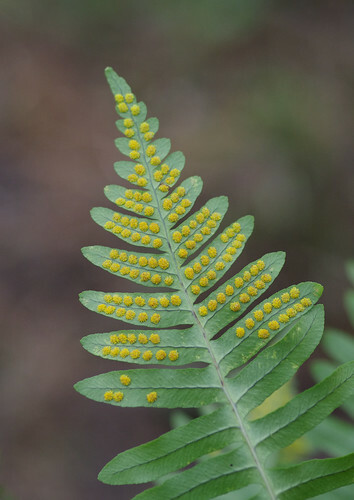 Care should be taken if choosing to handle ferns. 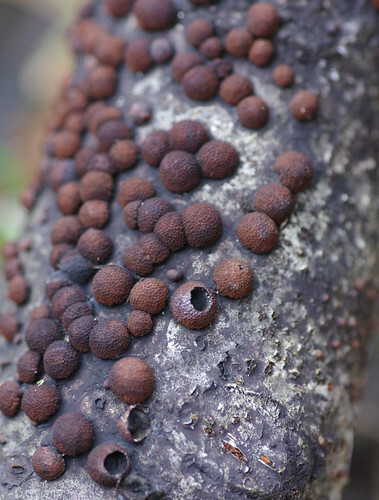 Years ago I read somewhere that ripe spores could be carcinogenic. By now we had reached the end of the level disused tramway and were on the return leg. The high river levels had badly eroded sections of the path. The soil had been washed away and many tree roots had been exposed. The main patterns on this trunk I have decided to come back to. I suspect, though, that they could be two different colour variations of the same species. Only time, and repeated observation, will tell. 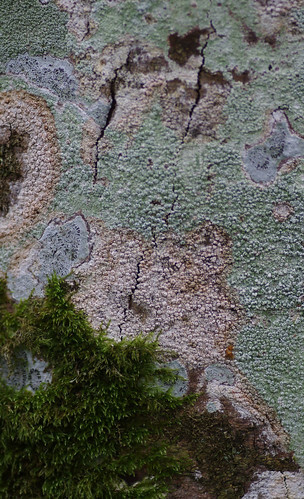 Above the highest moss, at the top left and near the top right, I think there is an example of Arthonia radiata. The minute black characters within the thallus are irregularly-shaped and sometimes branched. Anything more specific has proved elusive thus far. 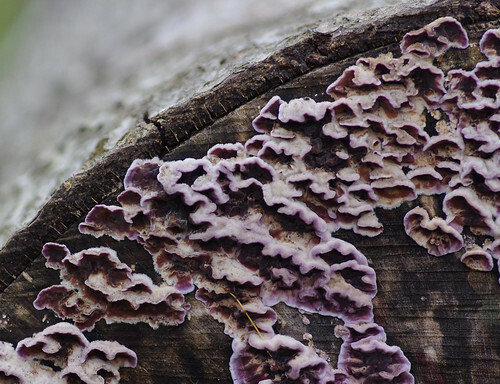 There were different patterns and textures of this species. Whichever way the shot was taken they appeared somewhat furry and blurry. A felled giant of a beech trunk and nearby log piles and branches kept us busy for a while. 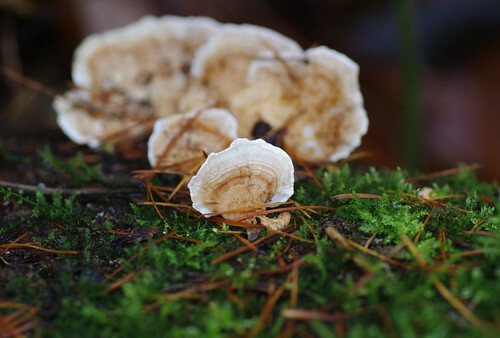 All sorts of fungi had found a new host and had spread. I'm not sure I can remember the trunk or logs being there during our last visit. 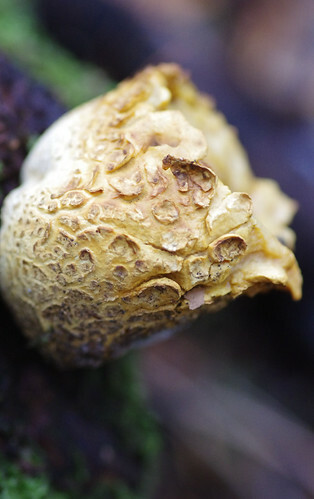 This nobbly, bobbly texture was unmistakeable and provided the last species of the day. On the way back to our original path, the water surged over the weir. Downstream, Lady was kept on a lead for her paddle and looked on enviously while other dogs were given a free rein. But to us the currents still appeared too strong. Better to be safe than sorry, I thought as we approached the end of our Parke walk and neared Mill Marsh Park once again.